A treat for the kids for Easter . . . or anytime! These are great idea for the kids for Easter, for them to make themselves or to be served on Easter morning. They are great fun and something a little different. They are certainly not something new however, as they are something the Chinese have been making for hundreds of years. 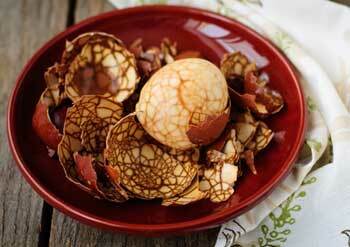 The essence or the trick with these eggs is that one should only crack the shell and not the thin membrane underneath . . . a few attempts may be needed to achieve this. If the membrane / skin is broken the eggs will change colour totally and not have the nice marbling effect as can be seen here. An alternative to the tea mixture is simply soaking the cooked, cracked eggs over night in a variety of water to which you have added food colouring. Using different containers of red, yellow, etc will result in a multi-coloured assortment of eggs that can be served.